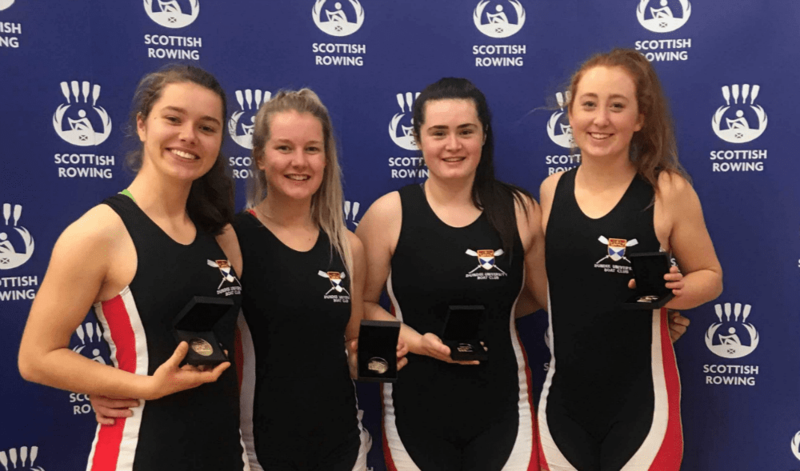 Dundee University Boat Club women’s team stormed to success at the Scottish Rowing Indoor Championships at the Ravenscraig Regional Sports Facility in Motherwell at the weekend with a haul of medals including a clean sweep in the prestigious women’s student open 2k race. Eleanor Brinkhoff, a 4th year biomedical sciences student, powered her way to gold in an impressive time of 7.14.1 with student nurse Katie Canniford and maths student Fiona Lapp in close pursuit to take the other two podium places in 7.19.5 and 7.23.5 respectively. Katie boosted her own medal haul, and that of the team, still further with a bronze in the women’s open sprint, covering the 500m distance in 1.37.7 and bronze in the women’s open 2k while Eleanor added another silver to the team tally with a second place finish in the women’s open 2k. Second year Fine Art student Rosie Handley also made it onto the podium with a bronze in the women’s student open lightweight 2k in 8.02.9 and third year medical student Rosie Morgan showed her potential with a bronze in the women’s student beginners 1k event with a time of 3.33.3. Boat Club Captain Hannah Campbell described the championships as the “most successful” the club has ever had. “This year at SIRC we had 24 athletes competing for Dundee University Boat Club and it was the most successful champs we have had to date,” she said. “The senior girls dominated the student 2k event which is fantastic for a club that is solely run and funded by students. Stevie Baxter, workforce development manager with Scottish Rowing, also praised the club.